On Saturday 13 October, the racist ‘Democratic’ Football Lads Alliance (DFLA) have organised a demonstration for bigots and Islamophobes in London. Tommy Robinson, ex EDL leader and notorious fascist, who is being courted by UKIP, is a firm favourite of the DFLA. 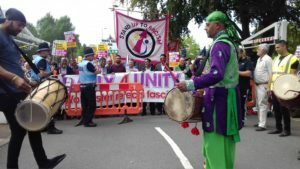 Thugs linked to the group attacked RMT union members and others, after a recent anti fascist march in London. The far right, at street level and electorally, use Islamophobia as a way of rebuilding in Britain. Across Europe racist and fascist organisations are receiving growing support at a level not seen since the 1930s. But we can stop them. RESIST The DFLA and their supporters want to come to London to spread racism and Islamophobia. Stand Up To Racism, supported by Unite Against Fascism and Love Music Hate Racism will be resisting their hate. Join us in opposing the DFLA and invite friends along.